- Publisher This book was designed for parents, home educators, and Sunday school and Christian school teachers who want to provide children with fun and rewarding craft projects that teach them about God's love. Easy Christian Crafts is filled with easy-to-make projects that reinforce Christian teachings, Bible story lessions, and Scripture readings. Each craft project begins with a Scripture reference and a short summary to help guide the parent/teacher. Read the entire biblical passage with the children, discuss its meaning, and then follow up with the craft project. Hands-on learning experiences help children remember and understand what they have been taught. Book jacket. Designed to provide children in grades 1 to 3 with fun and rewarding craft activities, this book is filled with easy-to-make projects that reinforce Christian teachings, Bible story lessons, and Scripture readings. 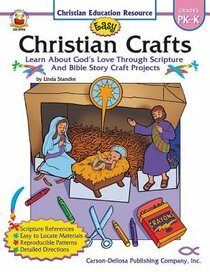 About "Easy Christian Crafts Reproducible (Grades Pk-k)"
This book was designed for parents, home educators, and Sunday school and Christian school teachers who want to provide children with fun and rewarding craft projects that teach them about God's love. Easy Christian Crafts is filled with easy-to-make projects that reinforce Christian teachings, Bible story lessions, and Scripture readings. Each craft project begins with a Scripture reference and a short summary to help guide the parent/teacher. Read the entire biblical passage with the children, discuss its meaning, and then follow up with the craft project. Hands-on learning experiences help children remember and understand what they have been taught. Book jacket. Linda Standke is well-known in the field of Christian Education. She was the Coordinator of Children's Ministries at her church for five years and currently holds the position of Coordinator of Youth and Family Ministries. She has authored over 25 books and teaching resources for preschool through sixth grade children. Linda says, "To be spreading God's message through my books is a blessing in my life and an answer to prayer." She lives in Minnesota with her husband and four sons.